Courtney Lee Weida has published an article, "Born from Books: Digital Spaces of Adolescent Art and Echoes of Artists’ Books" in Media: Culture: Pedagogy. I learned of it when she asked permission to use an image of mine. She kindly mentions the web presence of makingbooks.com. Many adolescents interact with text in a digital fashion via Kindle, the Gutenberg Project, and/or Google Books with greater frequency than traditional books. This article explores artists' books and bookwork as structural and conceptual metaphors for digital spaces of art created and/or utilized by teenagers. Artists’ books can be categorized as art and artifact—as materials of historical record, commentary, and personal expression. 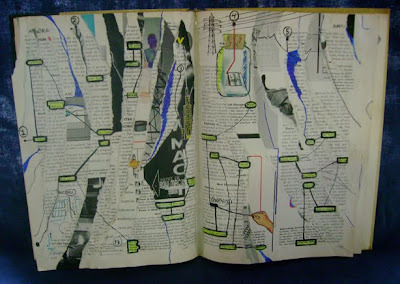 While book arts often engage in self-conscious reconceptualizations of text and image, digital media such as wikis, blogs, and online social networks dovetail, extend and/or reflect/are reflected by questionings of the book format as well. This article examines digital spaces (places?) of youth culture and artistic expression such as Myspace, Facebook, deviantART, and others. Artists' books often challenge traditional forms of publishing and codex, addressing questions of media and message parallel to ongoing issues of technology in our digital age. Digital spaces of art utilized by adolescents take on a similar autonomy, marginality, and liminality to limited edition and/or self-published artists' books. At the same time, both artists’ books and young artists’ websites contain a certain element of awareness of the viewer/spectator within narratives and documentary structures, serving as uniquely interactively engaging contexts of art education.